Galex Far-UV survey image centered on 40 Eridani B. The story was written in the early 1950s, just as the future evolution of the Sun was beginning to be understood, but before the Henyey technique for computing full stellar evolutionary sequences had been developed. The scene, while compelling, seems to make little astrophysical sense. It describes a parent star on its ascent of the red giant branch, yet the star’s overall luminosity seems clearly on the wane. In truth, as a red giant swells up, its overall luminosity increases drastically, and the end game for habitable planets consists of fire rather than ice. Earlier this year, however, there was a very interesting paper by Eric Agol that discusses the possibility of Earth-like planets orbiting white dwarf stars. These planets, if they exist, would be spin-synchronized and would have orbital periods of order 10-20 hours. On such a world, the demise of habitability occurs as the parent white dwarf loses its heat of formation, and grows gradually redder, even as it maintains the same angular size in its fixed position in the sky. Here’s the relevant summary diagram from Agol’s paper. As the parent white dwarf cools, it travels vertically up the plot. Now admittedly, this set-up is sailing pretty close to the wind. Indeed, I’ve largely come to adopt the opinion that the whole idea of the “habitable zone” is the modern-day equivalent of Bode’s Law. And furthermore, it’s not exactly clear how one might arrange for habitable planets to be orbiting white dwarfs. The reason I’m enthusiastic is that Agol’s scenario is eminently testable. If white dwarfs harbor Earth-sized planets in quantity, then they can potentially be discovered by backyard astronomers. A one-Earth radius planet on an a=0.013 AU orbit around a typical 0.6 solar-mass white dwarf produces a central transit depth of ~50% during a transit that lasts one or two minutes. This is a “call for observers” for a 1-month project to evaluate feasibility of amateurs and others to detect white dwarf transits using available hardware. This should be viewed as a “pilot project” designed to provide a first evaluation of the abundance of exoplanets orbiting white dwarfs in short-period orbits (near the habitable zone). It can play a role in designing a funded project using professional hardware to conduct a long-term and more comprehensive white dwarf (WD) transit search. Professional astronomer guidance is provided by Prof. Eric Agol, who has written several articles on the subject of exoplanets in WD habitable zones. I will archive light curves at a web site in a manner similar to what I did for the Amateur Exoplanet Archive (AXA). I have tentatively identified September as the observing month. Coordinated observing by partners is encouraged to permit corroboration of any interesting light curve feature. Note that since WDs are very small, comparable to the Earth, a central crossing by an Earth-size exoplanet will produce a very deep transit feature, possibly causing a temporary complete fade. Another consequence of the small size is that transit lengths will be short, typically a couple minutes. In spite of the great depth the search for WD transits is an observational challenge because of the short length. The chance of success in detecting a WD transit may be small but the payoffs for success are great! Anyone with experience observing exoplanet transits is qualified for this project. However, of the known 20,000 or so WDs only 168 are brighter than V-mag = 14.0. This means that telescope aperture matters, and for most WD targets an aperture of at least 10 inches will be needed. Please forward this e-mail to anyone who might be interested in participating as an observer or professional adviser. Reply to this e-mail if you would like to receive occasional updates on PAWM. A few weeks ago, I was in West Texas, seeing first-hand places that were familiar only from articles and maps. Marfa, Big Bend, the Glass Mountains. The landscape west of the Pecos River, dry to begin with, is in the grip of exceptional drought. The temperature was over 100 degrees Fahrenheit, and there was a hot incessant wind. From a ridgeline near the top of an eroded volcanic intrusion in the Chisos Mountains, dry basins and ranges extended into the infinite hazy distance. It was easy to imagine that the Earth had lost its oceans, and had become a desert planet, with isolated pockets of life clinging to retain the veneer of a respectable planetary habitability. There’s a recent, highly engaging article by Kevin Zahnle and collaborators (Abe et al. 2011) that argues that such a world might be better suited than the present-day Earth at staving off the biosphere-terminating ravages of the runaway greenhouse effect. Desert, or “land” planets keep their stratospheres dry, which allows them to better retain what water they do have, and land planets can more effectively re-radiate infrared radiation into space at given surface atmospheric pressure, allowing a cooler surface temperature at a given stellar flux. It cools down at night in the desert. Abe et al.’s global climate models indicate that Earth will cease to be habitable in 2.5 Billion years. In the absence of oceans, on the other hand, they find that habitability would be extended by another 2 to 2.5 billion years. And provocatively, if Venus started out as a land planet, it may have been habitable as recently as a billion years ago. We can imagine another kind of habitable planet that has only a small amount of water and no oceans; it might be covered by vast dry deserts, but it might also have locally abundant water. We call such a dry planet a ‘‘land planet.’’ The fictional planet known as Arrakis or Dune (Dune, Herbert, 1965) provides an exceptionally well-developed example of a habitable land planet. In its particulars, Dune resembles a bigger, warmer Mars with a breathable oxygen atmosphere. Like Mars, Dune is depicted as a parched desert planet, but there are signs that water flowed in the prehistoric past. Dune has small water ice caps at the poles and more extensive deep polar aquifers. The tropics are exceedingly dry, but the polar regions are cool enough and moist enough to have morning dew. That star is not on the map! In Search of Planet Vulcan — The Ghost in Newton’s Clockwork Universe, by Richard Baum and William Sheehan, is one of my favorite astronomy books. It certainly has one of the best overviews of the momentous events and controversies surrounding the discovery of Neptune in September 1846. I’ll take the liberty to quote Baum and Sheehan’s recounting of the exact moment of Neptune’s discovery. “Right now I would like to find a persistent observer, who would be willing to devote some time to an examination of a part of the sky in which there may be a planet to discover… You will see, Sir, that I demonstrate that it is impossible to satisfy the observations of Uranus without introducing the action of a new Planet, thus far unknown; and, remarkably, there is only one single position in the ecliptic where this perturbing Planet can be located… The actual position of this body shows that we are now, and will be for several months, in a favorable situation for the discovery. Galle indeed proved to be his man. He received Le Verrier’s letter on September 23, and at once sought permission from the observatory’s director, Johann Encke, to carry out the search. Encke was skeptical but nonetheless acquiesced: “Let us oblige the gentleman in Paris.” A young student astronomer, Heinrich Ludwig d’Arrest, begged to be included, and joined Galle as a volunteer observer. That night, they opened the dome to reveal the observatory’s main instrument, a 9-inch Fraunhofer refractor aimed at the spot assigned by Le Verrier. Recalculated for geocentric coordinates, its position was at right ascension 21 h, 46 min, declination -13 deg 24 min, very close to the position occupied by another planet, Saturn. Neptune’s moment of discovery, at 11 PM Berlin local time on September 23, 1846, corresponded to 22:07 UT, or JD 2395563.4215. The period of Neptune is 60,190.03 days, or 164.79132 years. The first “Neptunian anniversary” of the discovery is therefore CE 2011 July 10 22:49:26.4 UT Sunday, that is, right now. In 1846, photography was still in its very earliest stages, and it would be nearly two decades until the publication of Jules Verne’s De la Terre à la Lune. 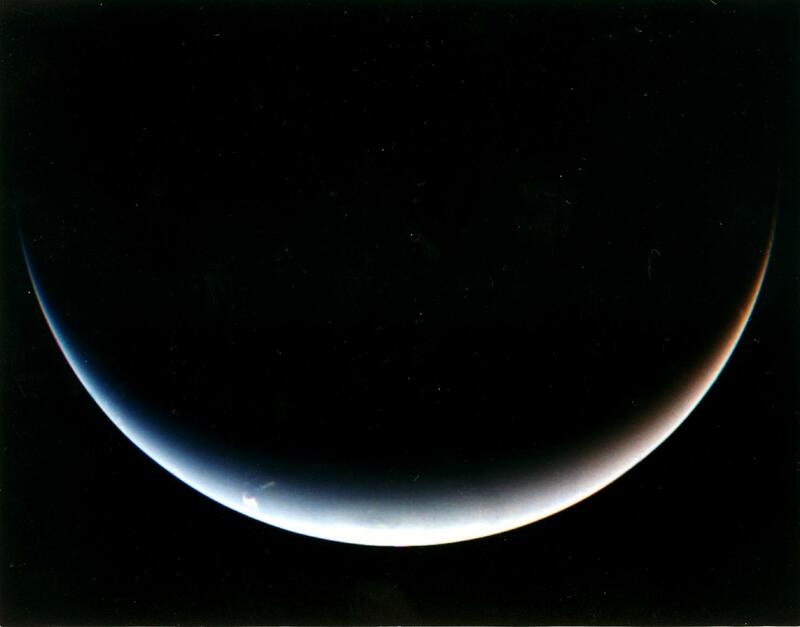 The fact that we greet the completion of one orbit in the possession of photographs of a crescent Neptune is a marvelous indeed. Certainly, an occasion for celebration! On Friday, I got an invitational e-mail from Gaspar Bakos, who is hosting a Neptune-at-One cocktail party in Cambridge, Massachusetts. I briefly perused airfares before sadly having to decline. A well-known theorem states that there’s no such thing as a free lunch. A corollary is that interesting discoveries tend to be made at the ~3-4 sigma level of confidence, and this is especially true if the supporting data is drawn from the public domain. If a signal is stronger than 4-sigma, then someone else has invariably pointed it out. If it’s weaker than 3-sigma, it’s probably wishful thinking. The plot shown is above is from a paper that Kevin and I submitted soon after the 1,235 Kepler planet candidates were announced last Spring. After going through review, it was accepted by the ApJ, and it was posted to astro-ph last week. The y-axis corresponds to the magnitude difference between a given star’s green (Sloane g filter) and red (Sloane r filter) colors. The x-axis charts the differences between the 2Mass J and H infrared colors for each star. Metal-rich stars tend to have redder optical colors than metal-poor stars, whereas the J-H index sorts the stars in terms of their overall temperatures (with cool stars to the right and warm stars to the left of the plot). Metal-rich stars thus lie along the upper part of the main-Sequence locus. The binned version of the plot provides a confirmation of several trends that were already very well known. First, among host stars with masses similar to the Sun that harbor giant planets, there’s a strong preference for metal-rich stars. This is the classic planet-stellar metallicity effect. Second, among low-mass stars, there’s a dearth of giant planet candidates. This is the known giant planet-stellar mass effect. Finally, among the solar mass stars that host low-mass planets, there’s no discernible metallicity correlation. The new result pertains to low-mass planets orbiting low-mass stars. The diagram shows that for this subset, there’s strong evidence for a metallicity correlation — At masses less than ~0.8 solar masses, higher metallicity stars are more likely to host low-mass planets. We take this as direct evidence regarding the overall bulk efficiency of planet formation for planets that aren’t required to bulk up via rapid gas accretion. Take a 0.7 solar mass with twice the Sun’s metal content and a typical 0.02 solar mass disk. The entire planet-forming disk contains about 150 Earth-masses worth of stuff heavier than hydrogen and helium. Kevin’s result is effectively saying that a good fraction of the time, a good fraction of this total burden of metals winds up in planets. We had to be careful. There are a lot of systematic “gotchas” that can potentially throw a wrench into the exciting big-picture conclusions, and so much of the paper is devoted to considering potential show stoppers in turn. I think that the result is robust, and that it will hold up as the planet catalog continues to grow.